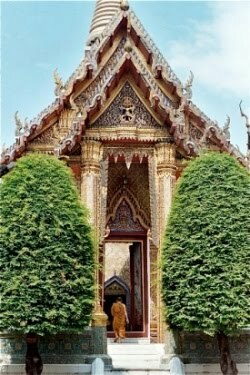 I tend to use the Pali term kamma rather than the Sanskrit term karma because my Buddhist education is grounded in the Thai Forest Tradition. Either term will work, however. Anyway, I told my friend that kamma isn’t created by the action, but rather the intention behind the action. One creates kamma via his or her intentions. He then asked me about light and dark kamma, and that’s when I had to admit ignorance. I had an idea of how to explain bright and dark kamma, but I didn’t want to misstate something. So I told my friend I would study the matter first. The best expression of what bright and dark kamma is can be found in the Anguttara Nikaya. The particular passage can be found in Thanissaro Bhikkhu’s Beyond Coping in the section on Heedfulness. And while not dealing specifically with the concepts of bright and dark kamma, the story of Angulimala also provides some excellent insights into the workings of kamma. As the Buddha explains each of these four types of kamma, it’s important to note the language used. “And what is kamma that is dark with dark result? There is the case where a certain person fabricates an injurious bodily fabrication...” The Buddha uses the phrase, “a certain person fabricates…” The concept of fabrications is pretty important in Buddhism; trouble is most people have the wrong idea of what it means. A rose is a rose no matter what we call it. As a collection of matter, a rose simply is. The name “rose” is the mental fabrication we create to ascribe to a plant that has certain physical characteristics. Go to a different country where a different language is spoken and the mental construct has a different pronunciation, but the rose is still a rose. When the Buddha describes kamma, it is associated with the mental fabrication associated with the intent to commit an act of either speech, body, or mind. So in the case of dark kamma, that fabrication begins with wrong intent, with an intent to cause harm. The consequences that manifest after an intention of dark kamma are the results of kamma, the fruits of kamma, not the kamma itself. Bright kamma, hence, begins with a fabrication that causes no harm. Hence, the fruits of bright kamma are pleasant. We often get confused when we seem to get mixed results from our actions because we think we have a good intention. This is what the Buddha refers to as kamma that is both bright and dark. As Thanissaro Bhikkhu explains here, we may think we have good intentions, but if we really examine our intentions, they are often unclear and confused; hence the outcomes of our actions bring us confusing or mixed results. This happens a lot in interpersonal relationships, particularly among we moes. Remember the film “The Broken Hearts Club” and how Dennis befriended the cute newby Kevin (oh god, Kevin was such a darling!)? Dennis clearly had the hots for Kevin, but he wanted to appear more virtuous than the callous Cole, so Dennis concocts this idea that Kevin needs a true friend when Dennis’ real intention is to get Kevin in bed. All of Dennis’ friends see this for how it really is, but Dennis chooses to believe in his false intention. While the outcome is not completely messed up, the results definitely are mixed. Most of our lives are filled with this combination of bright and dark kamma because for most of us, we really don’t understand our real intentions, either intentionally or because we just never really took a close look at our actions and the motivations behind them. This is why we meditate. To stop the chatter in our minds so that we can see the truth behind all our thoughts, words and deeds. 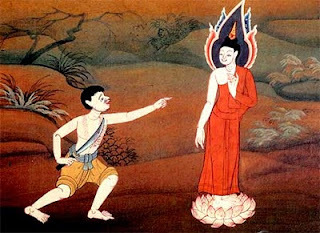 Angulimala ran into this problem even after the Buddha accepted him into the sangha. At first, Angulimala couldn’t get anyone to offer him food during his alms rounds because he remained feared and despised for all of his past murderous actions. Even after the Buddha set up an act of truth to show others Angulimala’s new noble birth and he became accepted by more villagers, there remained a group who refused to believe that Angulimala was nothing more than a murderous monster. Whenever he went for alms, these holdouts threw rocks and sticks at him. One time he comes to the Buddha, his head bleeding, to show the Buddha what had happened. The Buddha tells Angulimala to buck up and endure this because he is lucky to be suffering this torment now as the continuing fruits of his past actions rather than to suffer those consequences by spending eons in a hell realm. The final type of kamma is what the Buddha describes as being neither dark nor bright. This is when we abandon all kamma and we are free of any other intention other than to liberate ourselves from the cycle of birth and death. I haven’t a clue as to what that must be like. My days are still mixed with brightness and darkness, a muddle of intentions that I am barely able to discern. Why couldn’t I help you Lance?